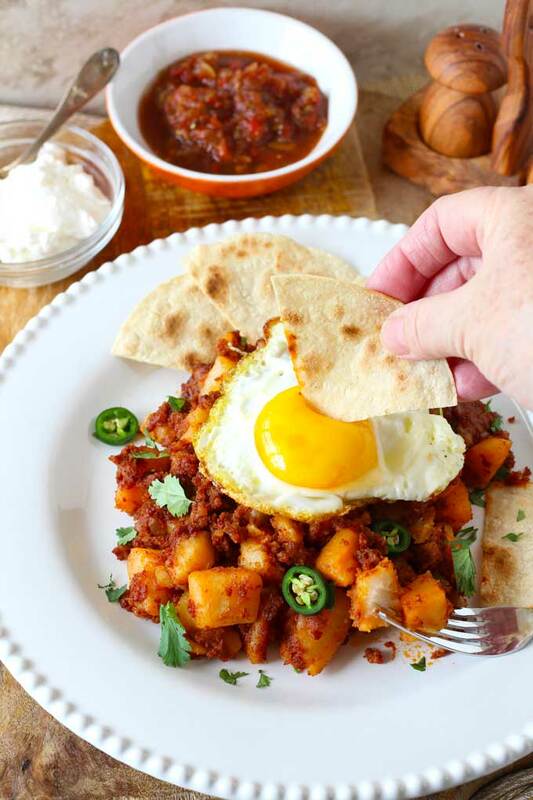 You are here: Home / Breakfast and Brunch / Potato and Chorizo Hash ~ One-Pan, Easy & Delicious! 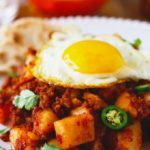 Potato and Chorizo Hash ~ One-Pan, Easy & Delicious! This Potato and Chorizo Hash has crispy bits of perfectly cooked chorizo, tender potatoes, and a world of flavor! 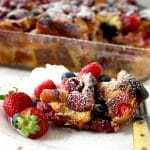 An amazing one-pan easy and delicious breakfast (or dinner)! Let me start by sharing with you the fact that I am not a morning person. Not at all! I’m the type of person who won’t even let small conversation happen before I have a cup of coffee in the morning. The concept of someone waking up at the crack of dawn feeling rested and with a happy attitude is a foreign concept to me. For that reason, when my kids ask me for breakfast anytime before 11:00 am 9:00 am, I point at the cereal boxes without a smile! This sometimes creates problems with my oldest son because he loves nothing more than breakfast foods! He also thinks I run a restaurant so he gets particularly annoyed at the idea of eating cereal when he has a chef-mom who could possibly make 3 restaurant style gourmet meals a day + 4 substantial and somewhat interesting snacks!! Did I tell you I am his chauffeur too? 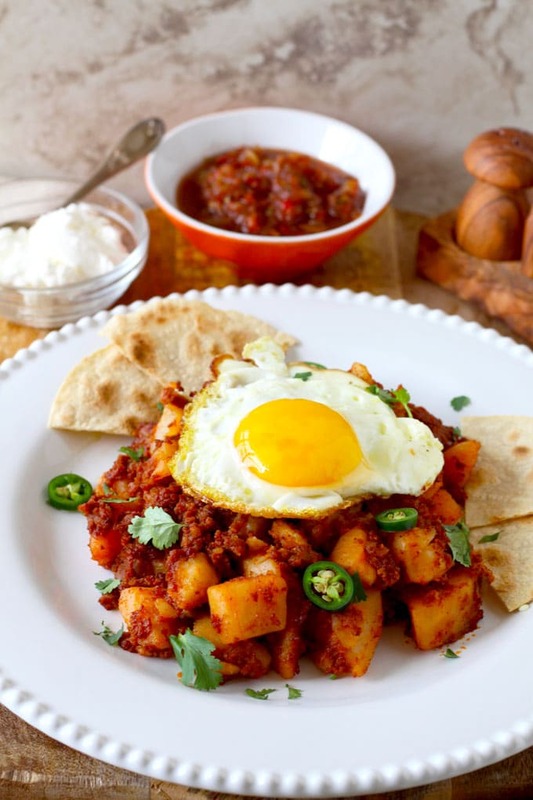 This Potato and Chorizo Hash is one of his favorite breakfast foods. 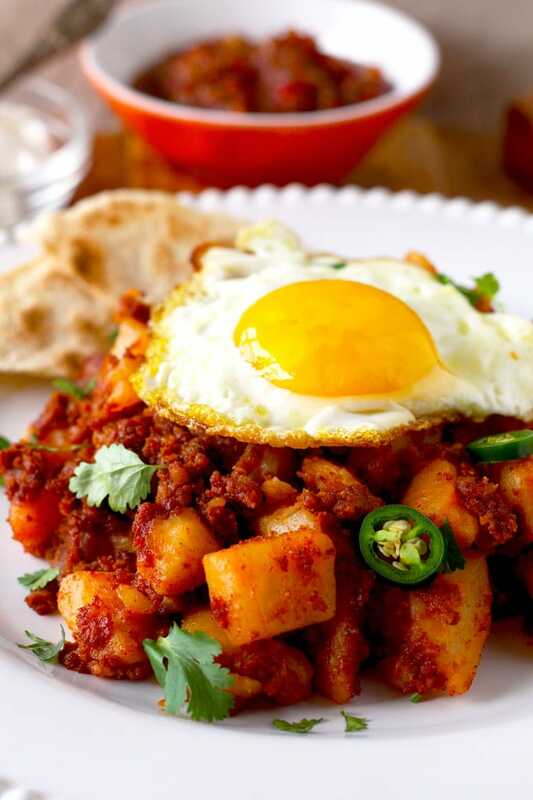 Chorizo has so much flavor it doesn’t take a lot of effort to make this hash incredibly delicious. Now let’s talk about Chorizo! They are not all created equal and it is important to know the differences between the ones offered at the market. 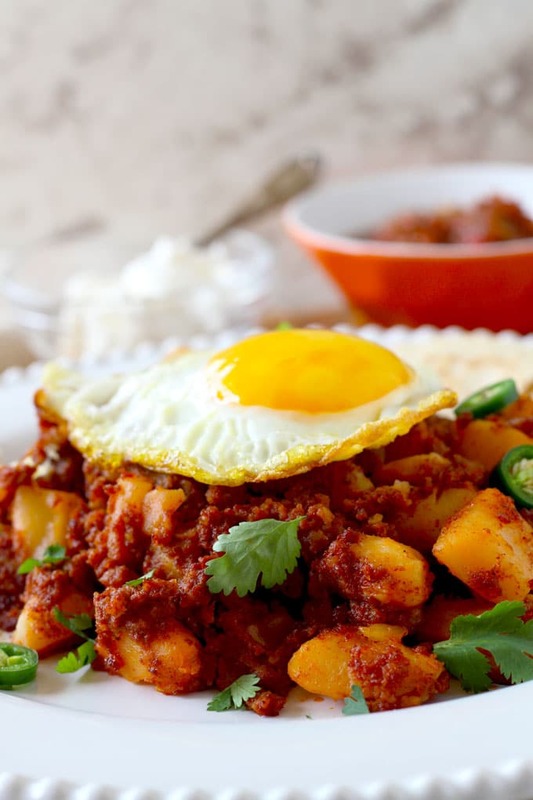 Mexican Chorizo (this is what we are using for this Potato and Chorizo Hash). It is finely ground, highly seasoned, fresh, uncooked sausage usually made from pork (sometimes made from beef and sometimes vegan). Sold by the pound, stuffed into natural casings but most the time found stuffed into plastic sleeves that need to be cut opened and squeezed out (I know it doesn’t sound that appealing but trust me it is delicious!). Most versions are bright red in color due to spices like paprika and achiote. Spanish Chorizo is a firm, dried and cured sausage (almost as firm as salami). It is sold by the ready-to-eat cured meat products. They can be smoked or not, spicy or sweet. It is made of chopped pork and pork fat and seasoned with smoked paprika. It can be eaten “as-is” casing and all! When cooked, it keeps its shape. Tapas anyone? Also, an excellent addition to paellas. South American Chorizo, is a coarsely ground sausage made from pork and seasoned with spices and garlic. It is sold uncooked and stuffed into natural casings. It has somewhat of a milder flavor compared to the other two chorizos listed here. It is a staple of Argentinian parrilladas (grilled meats). 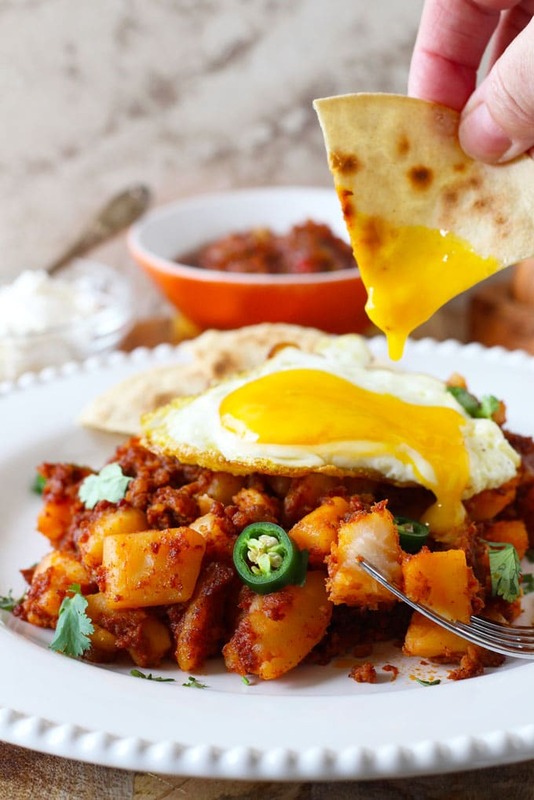 The key to Mexican Chorizo success in a hash (or in a taco) is to cook it well – until well done! And then cook it a bit more! It takes a bit of time, but it makes all the difference. At the beginning of cooking is going to look a bit wet, like bolognese sauce (cooking it to this point is what you would do if you were cooking something like chili with chorizo). Then it gets a bit dry – just keep cooking it! I always tell my son “it’s ready when it changes colors!!!! !” What I mean is, it’s not as bright anymore, it looks almost as if each bit is crispy. After that, we add the potatoes and a bit of butter (because potatoes love butter). You want to get a bit of a crust on the potatoes so I usually let them cook undisturbed before I toss/stir them. After that, I add salsa and a few dashes of hot sauce. If you don’t like spicy foods, make sure you buy mild chorizo. Use mild salsa and feel free to skip the hot sauce! To top it all, eggs! Over easy, over medium, sunny side up, scrambled, poached….. it’s up to you! Some chopped cilantro on top, sliced jalapeños, sour cream, extra salsa and some warmed tortillas and you are set! 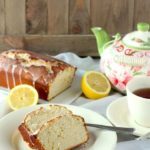 An amazing, flavorful and easy breakfast perfect for any time of the day! Feel free to add some onions! When your chorizo is cooked, add a little bit of butter into the pan and about 3 tablespoons of chopped onions. Saute until the onions are translucent. Then add the potatoes and follow the rest of the recipe. This cast iron skillet is what I use for cooking this dish. Crispy bits of chorizo, tender potatoes, and a world of flavor! 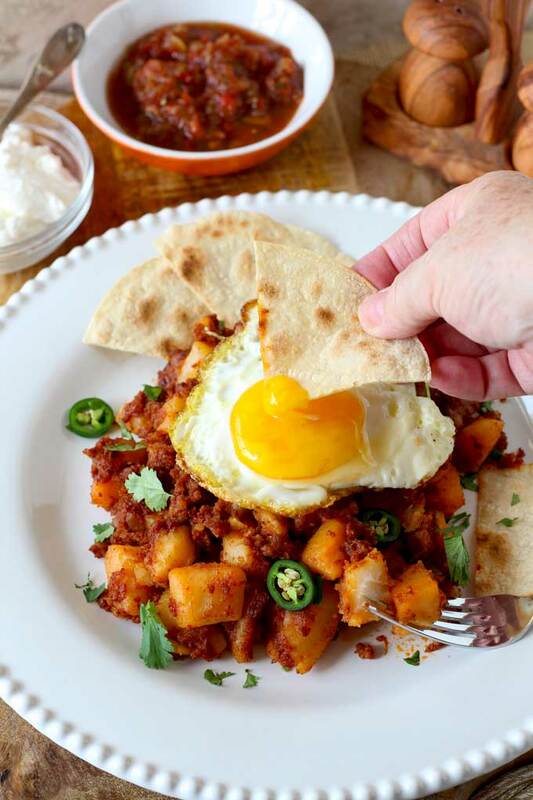 This Potato and Chorizo Hash is a one-pan easy and delicious breakfast (or dinner)! Heat a large non-stick or cast iron skillet over medium high heat, add the chorizo and cook stirring frequently breaking up the clumps, until the chorizo is crisp and fat has rendered. About 10 minutes. Add the cooked potatoes and the butter to the skillet and sauté, stirring and tossing occasionally for about 8 - 10 minutes. You want to create a bit of a crispy crust at the bottom of the skillet. Add the salsa and a few dashes of hot sauce and continue cooking for about 5 minutes. Season to taste with salt and pepper. Serve immediately topped with your favorite styled eggs, cilantro leaves and jalapeño slices. Serve with warmed tortillas, sour cream, and salsa. Asparagus Frittata ~ With An Italian Flare! Previous Post: « Brined and Roasted Turkey ~ Perfect Every Time! Oh my this is so good. This is my first time cooking with chorizo. I added split Brussels sprouts fried in garlic and oil . I served it as a quick dinner. This is a new family favorite. Thank you for the info on how to know it is cooked. Hi Naida! Welcome to the wonderful world of chorizo! Adding the Brussels Sprouts sound like a fabulous idea! I must try it for sure! Thanks for sharing!